Natural stone has a distinct charm that enhances the appeal of any outdoor setting. It complements the look of the greenery of the plantings and other features in the landscape and is extensively used in landscaping projects big and small. Flagstone is a very popular landscaping material and is used in a number of different applications. We at Rou Pavers are one of the leading companies in the hardscaping space and have created a distinct niche for ourselves in the industry. 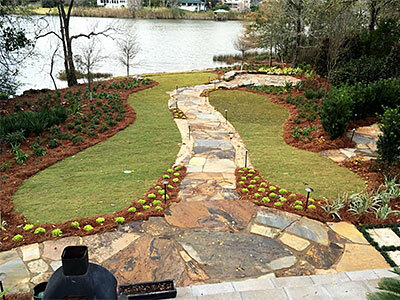 Our company has handled a significant number of flagstone installation projects for clients in and around Pensacola, Golf Breeze, Pace, and Milton. Our experts have designed and constructed impressive flagstone surfaces on properties in Navarre, Navarre Beach, as well as Pensacola Beach. We are ICPI-certified installers and clients from across Fort Walton Beach, Baldwin County, and the surrounding areas trust only us for all their hardscaping requirements. Flagstone has a very earthy and natural appearance that blends in well with casual as well as formal-styled landscapes. You can use it for different types of landscape themes such as tropical, modern, contemporary, middle-eastern exotic etc. This stone is available in a variety of colors and hues such as red, yellow, sand, natural light grey, charcoal grey, moss green, and brownstone etc. This means you can create the look you want in your landscape. You can also use a mix-and-match of different colored flagstones to create the patterns you want. Flagstone has a classic color and shade variation; this helps create very unique-looking outdoor spaces on your property. The structure of these stones is such that the slabs or pavers can be very narrowly packed and this helps create a permeable surface that’s great for outdoor settings such as poolscapes, patios, decks, driveways, courtyards, outdoor kitchens and more. This makes the material extremely versatile. You can add an even more interesting touch to your pathways, driveways, and walkways by installing flagstone slabs with equal width gaps for grass, gravel or some other ground cover. It is also very easy to maintain and an occasional pressure-wash is all it requires to keep it looking great right round the year. This is a very durable and weather-resistant natural stone that provides excellent value for money. We recognize that every property owner has some specific ideas about what they want their outdoor spaces to look like. It’s why we provide custom solutions. We work closely with you to understand what your ideas and design objectives are and then provide solutions that are right in line with your requirements. If you are looking for flagstone paver contractors that will cater to your specific needs and give form to your ideas, we are the company to come to. For any more information on our services and flagstone installation cost, feel free to contact Rou Pavers at 850-791-5641. You can send us your project details via this Contact Us form or request a free estimate and one of our experts will get in touch with you shortly.